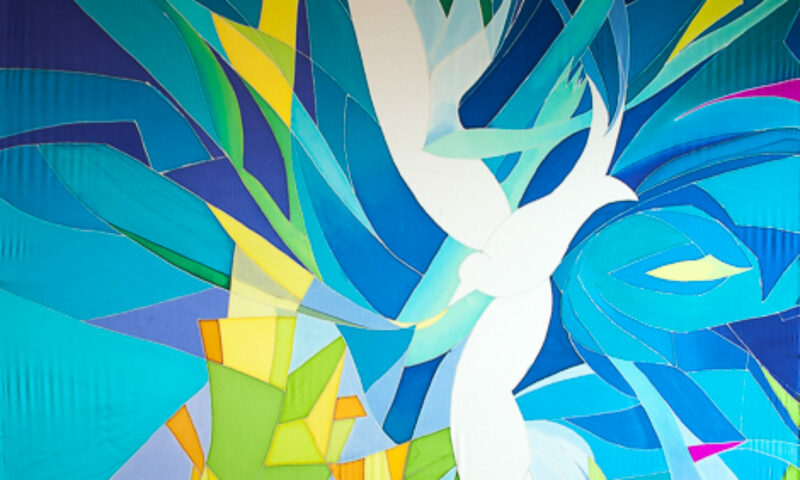 This 4-panel mural was commissioned by Trinity Lutheran Church, Coeur d’Alene, Id, for their entryway, and was finished and installed in the fall of 2008. Each arched panel is 68×42 inches. Together the whole work measures 5 feet 6 inches tall by 14 feet wide. A secret waterfall, along with local Lake Coeur d’Alene, was inspiration for this painting representing water as a reminder of the sacred presence in all of life. Three panels making up the waterfall create a place for reflection, prayer and inner transformation, and the fourth panel, looking out towards the vast expanse of Lake Coeur d’Alene, represents the need to go out into the world mindful of our call to transformative action in the world. Click on a thumbnail picture below, then follow navigational arrows. This acrylic painting is on 3 panels of masonite, 8 feet tall by 4 feet wide each. Commissioned in 1999 by Holden Village pastor Susan Briehl, her assignment to me was to paint a “crucifix upon which the wood is alive.” This was a hard enough assignment, since I struggled with the idea of the cross, but it also needed to be VERY LARGE to fit the scale of the gymnasium which would be our worshiping space. 8 feet high by 12 feet wide! At the time I had thought a 30″ wide watercolor painting was quite large. With a crazed look in his eyes he noted the faint halo over the head of the figure, and continued, “And don’t you ever think that a halo is simply a reflection of the glory of God upon the head. The saints used to gather up energy from the ground, given to the Earth by God (he pointed to the waterfall, the “river of the water of life”, then the roots of the tree-figure) to make abundance for the good of all.” (Now he spread his arms, imitating the figure, and points to the fruits and the leaves.) “The saints glowed from this God-given life energy moving through them! This stranger helped me answer verbally the questions I had been asking visually, bringing my search closer to conscious answers. “I knew there was a good reason for me to come to Holden now,” he proclaimed. And I am honored to live and paint at Holden, surrounded always by surprising people.